Nicotinamide Adenide Dinucleotide (NAD+) and its immediate precursor Nicotinamide Mononucleotide (NMN) have both been shown to quickly elevate levels of NAD+ in various tissues and organs throughout the body. There WAS controversy as to the mechanism on the path these molecules may take to enter cells. Research published in January 2019 shows that the Slc12a8 protein is a dedicated transporter that carries the NMN molecule (but not NR) directly across the cellular membrane. In conclusion, our results demonstrate that exogenous NAD is effectively imported into the hypothalamus and increases hypothalamic NAD content. Therefore, NAD supplement can constitute a therapeutic method for metabolic disorders characterized by hypothalamic NAD depletion in humans. In this study published in September 2018, administration of LABELED NAD+ by IP and IV injection demonstrated that exogenous NAD+ crosses the blood brain barrier to enter the hypothalamus INTACT, reduces hunger and weight gain, and increases energy expenditure and fat burning in mice. This study also shows that NR and NMN can not utilize the cd43 gap to cross the blood brain barrier! This might explain why NAD+ clinics have found success treating addictions and other brain imbalances, but NR and NMN have not been used in similar fashion. 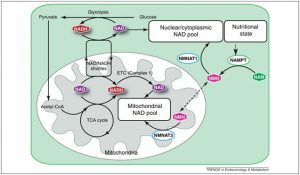 Pharmacological effects of exogenous NAD on mitochondrial bioenergetics, DNA repair, and apoptosis. In this study, administration of LABELED NAD+ by IP and IV injection demonstrated that exogenous NAD+ crosses the blood brain barrier to enter the hypothalamus INTACT, reduces hunger and weight gain, and increases energy expenditure and fat burning in mice. This study shows that NAD+ levels in the blood have a direct effect on the levels of metabolic activity in the body. They also show that NR and NMN can not utilize the cd43 gap to cross the blood brain barrier. In mice, exogenous NAD may be transported to the hypothalamus via Cx43 at the blood-brain barrier  thereby increasing hypothalamic NAD content and decreasing food intake and weight gain. Reduced NAD+/NADH ratio is strongly implicated in mitochondrial disorders and, age-related disorders including diabetes, obesity, neurodegeneration and cancer [26, 53, 60, 71]. NAD+ levels also decline during aging in multiple models including worms, rodents and human tissue [17, 45, 67, 72]. NAD+ administration decreases doxorubicin-induced liver damage of mice by enhancing antioxidation capacity and decreasing DNA damage. NAD+ at the doses of 100 or 200 mg/kg was also injected intraperitoneally 1 h before the DOX administration. NAD(+) is capable of increasing the antioxidation capacity of tissues. Exogenous supplementation of NAD restores the intracellular levels of NAD and blocks the cardiac hypertrophic response. The profound protective effects of the intranasal NAD+ administration were also observed at 72 hrs after ischemia. Do the NAD+ sublingual supplement impact sleep cycles giving us eres a harder time to sleep? Do they have a caloric response and break a fasted state? First of all, thank you for bringing NAD+ related supplements to market. Your illustration above shows the NMNAT1 enzyme. NMNAT1 is the NMNAT version found in the cell nucleus that helps convert NMN into NAD+. Have you been able to prove that the NAD+ supplement makes it into the cellular nucleus?